Folders and files can be complete or partially randomly named with Rename Expert. This makes it possible, for example, to change the order when playing MP3 files or view photos in a slideshow. It can be determined which types of characters are to be inserted into the file name. The choices are lowercase letters, uppercase letters and digits. These can also be combined, for example, to generate the following strings: "53791546", "AACZEO", "esxcij" or as a combination "T56ghI9bx". 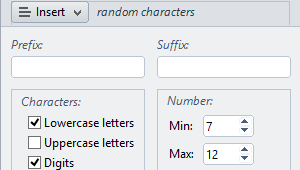 The number of random characters can be defined precisely by specifying the minimum and maximum number. To generate the same number for each file name, both values can be set to the same value. An application example is the insertion of a ten-digit sequence of numbers in the file name to avoid multiple occurrences of the same name or to mix files. Additionally, it is also possible with Rename Expert to insert a random numbering into the file name to ensure a random arrangement of files in Explorer.